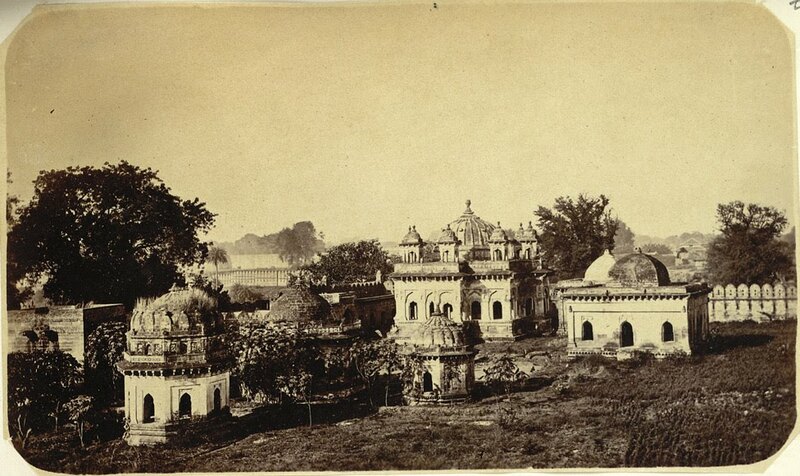 Photograph of the Gond Rajah's Tombs at Chandah in Maharashtra from the Allardyce Collection: Album of views and portraits in Berar and Hyderabad, taken by an unknown photographer in the 1860s. 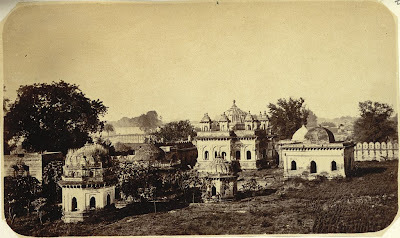 In the Central Provinces List of 1897, Henry Cousens wrote, "Chanda is a large walled town situated in the fort between the Jharpat nala [river] and the Erai river...The walls were built by the Gond Raja Khandkia Ballal Shah, the contemporary of Akbar...The only buildings of any consequence are some temples and the tombs of the later Gond kings, the last are plain and substantial buildings, but rather heavy in appearance. The gateways offer good specimens of Gond art, as they are ornamented with sculptures of the fabulous monster lion overpowering an elephant, which was the symbol of the Gond kings...The Gond tombs are eight in number, and belongs to...kings and queens...".